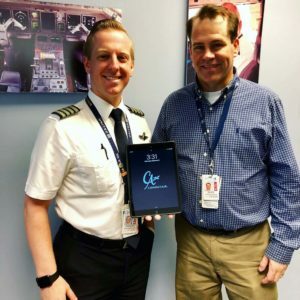 NORTH OLMSTED, OH., September 21, 2018, CommutAir, a United Express carrier (UAL), began issuing pilots iPads to replace heavy paper-based flight kits for its cockpit crewmembers. The implementation of Electronic Flight Bags (EFB) is a part of CommutAir’s commitment to establishing modern technology infrastructure to sustain its rapid growth. “Our monthly aircraft deliveries already make us the fastest growing U.S. Regional Airline. And we want to make sure that we have the technology platform to sustain that growth” said Joel Raymond, Chief Operating Officer. Founded in 1989, CommutAir operates as United Express and is majority-owned by Champlain Enterprises, Inc. and 40% owned by United Airlines, Inc. CommutAir operates ~1,000 weekly flights to 30+ destinations, using the Embraer ERJ145 aircraft, from bases in Newark, NJ, and Washington-Dulles. CommutAir’s 900+ employees are well-known in the industry for fostering a family culture and a friendly work environment.